In part one of this series, (Out of Position Against an Aggressive Opponent) you were in the big blind with A7 suited, and elected to call a 4xBB raise preflop against an aggressive opponent. The Flop is: 7-5-2, giving you top pair and top kicker. “TPTK” is a good hand when there’s two of you in the pot, but when the “top pair” is a pair of sevens, you’re vulnerable in a whole lot of ways. Even relatively “safe” overcards like eights and nines make a straight or two pairs possible, and anything ten or higher is too likely to give the villain a higher pair. Undercards like 6, 4, 3 can make a straight or two pairs (remotely) possible. In fact, the only turn cards you’d be comfortable seeing are an ace, seven, five, or two. Given all that, you’d probably like to end the hand on the flop. So how do you do that? If you bet first, you will probably get raised by an aggressive player, especially given the texture of the board (seven high). Your bet won’t necessarily be believed as representing strength. Now what? To take down the hand, you have to reraise, which is costing you about 50-70 big blinds (if you are playing 100 BB stacks, you should probably just go all in if you’re 3betting the flop). Now, do you really want to get all in with a pair of sevens? Really? You can’t call the raise, either, as you’re back in the same situation - almost any card that comes is a scare card. 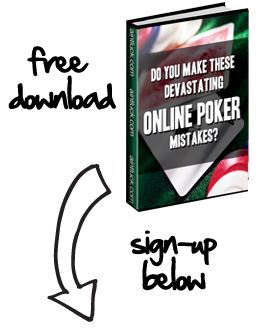 You would be wanting to keep the pot small in a situation where your opponent is likely to be betting aggressively. That is not a winning combination. 1) Represents strength: A check raise is almost always a strong move, done to extract value from a hand by (temporarily) representing weakness. 2) It takes down the pot more often than not: If your opponent is very aggressive, they will almost always stick in a continuation bet on the flop after raising preflop. If by chance they check behind on the flop, you now have some power. You can check the turn and make a call for value if they do bet, or perhaps make it a check raise if the turn is one of your safe cards (A-7-5-2) should be reasonably safe. Now they have to be cautious. If they bet the turn and you call, they have to behave themselves on the river. 3) Sticks to the rule of playing small pots with decent, but not great, hands: A standard raise on the flop would be to about three times their bet, or anywhere from 13 to 25 big blinds. That’s a whole lot cheaper than the 50+ it costs you to reraise if you bet first and get raised. If you risk three big blinds by calling preflop, see three flops, hit one, and extract a pot sized bet from them on the flop, you are about breakeven for the series. Not a bad result for defending your blinds at all. If you check-raise the flop, and they then follow up with a 3bet on the flop, you can reasonably find a fold there and give up on the hand. Don’t fold to flop 3bets too often, though, or the opponents will pick up on it, and you’ll get run over. You’d be better off folding quietly preflop in those situations in the future.